What if I were to tell you that there’s a money-saving device you can pick up for $30 or under at a resale store? It produces a product that you use daily for pennies on the dollar, and it’s both fast and easy to operate. What is this product I’m describing? It’s a product you’ve written off for years: the bread machine. 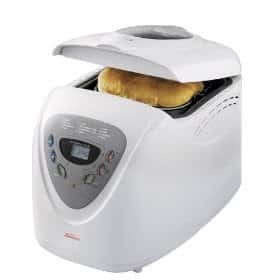 Bread machines used to be a staple in every household, but now they’re being dismissed left and right as luxury cooking machines that take up too much counter space. This couldn’t be further from the truth. Just think about how much bread you and your family consume per week. Even if you buy inexpensive bread that costs under $2 per loaf, if you consume two loafs per week, you’re spending at least $150 per year on bread. If you buy healthier breads, which are also more expensive, you could be spending as much as $5 per loaf. At two loafs per week, that means you’re spending almost $500 per year on bread! Most moms have had the following experience: you’re standing at the grocery store looking at a product that is healthier for your family than its less-expensive counterpart. You want to make the healthier choice but are worried about budget concerns, so you purchase the cheaper item. With a bread machine, you’ll never have to make that choice again when it comes to bread varieties. Traditional white bread can be made for just a few cents using the bread machine. Whole-wheat and multigrain breads can also be made for right around $1 per loaf. Best of all, it just takes a few minutes to measure out all of the ingredients, throw them in the bread machine, hit the button, and walk away. If you’re like most moms, the phrase “bake your own bread” probably makes you want to run away screaming. After all, you probably associate bread baking with pioneer women, whose entire lives revolved around preparing meals and cleaning house. You, on the other hand, have three kids, two dogs, and a job to worry about. But you don’t have to worry. Bread machines aren’t messy, and they certainly aren’t complicated. You throw all the ingredients in the machine and walk away. It’s that simple. If I asked you what you would most like to spend $150-$500 on, your answer probably wouldn’t be bread, but it’s a staple in our diets and in our homes. Saving just this much per year can go a long way. After all, that’s one sport’s fee paid for your kids, a night away with your husband, a new television or a car repair. Baking bread with a bread machine is one DIY project you can definitely handle.